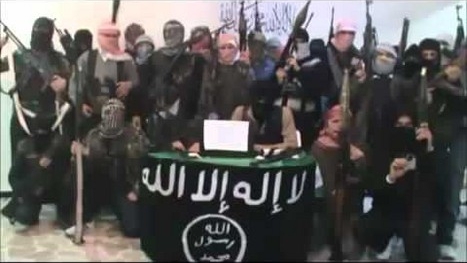 US-UK listed terror organization Libyan Islamic Fighting Group (LIFG) fighters and commanders are clearly amongst militants underwritten by latest UK funding. Clearly then, British aid is being sent to the FSA whose ranks are admittedly filled by Al Qaeda. Image: The Western media is covering – or more accurately, “spinning” – an unfolding sectarian genocide in Syria’s largest city Aleppo. 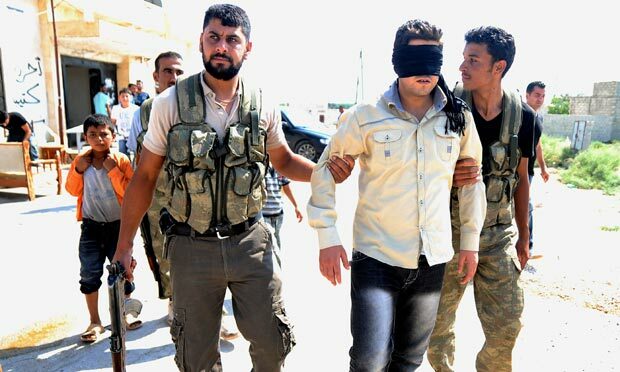 In the alleys of seized streets, FSA terrorists are detaining, torturing, and killing anyone suspected of supporting the government. Such suspicions coincidentally run along sectarian divisions. By using the label “Shabiha” for all of FSA’s victims, the Western press has given a carte blanche to genocidal sectarian extremists and by doing so, has become complicit in war crimes themselves. For the British, or any other nation for that matter, to provide the FSA with even rhetorical, let alone material support, is an egregious act of international terrorism. It is unclear whether Hague means – violating the laws of his own nation to provide material support for known, proscribed terrorists is “the right thing to do” – or if he means it is “right” to perpetuate the bloodbath in Syria as prescribed by the US Fortune 500-funded think-tank, Brookings Institution in their “Middle East Memo #21,” which suggested the West “pin down the Asad regime and bleed it, keeping a regional adversary weak, while avoiding the costs of direct intervention.” Either way, the unhinged, morally bankrupted foreign policy of the Anglo-American establishment is on full display, undermining and irrevocably damaging the legitimacy of their collective institutions in the process. The protracted difficulty of the West to repeat their success in Syria can be perhaps owed in part to the unhinged policy and agenda pursued and exposed in Libya.